Swarming bees rest at temporary perches until scouts find a permanent nest site. Even low lying shrubs are used. Honey bees have been in the news lately. No, not for their disappearing act associated with Colony Collapse Disorder (LINK TO MARCH 23, 2009) , but because they have been showing up in really unusual places as swarms. A few weeks ago a story appeared about legions of bees swarming at a store near Union Square in New York City while frightened employees huddled inside. A week or so later another swarm seemingly attempted to hitch a ride on the wing of an airplane at a flight training center in Danvers Massachusetts. What is it with these whacky bees? Back in the day growing up in rural New Jersey, late spring and early summer where always a time of high drama around the bee hives as we anticipated the annual swarms of honey bees. Swarming is a natural phenomenon in the honey bee world. 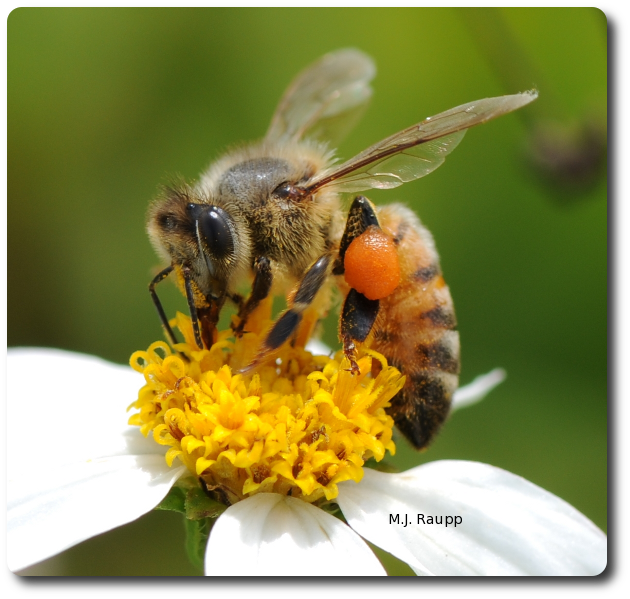 It is how healthy colonies reproduce and how honeybees fulfill their biological imperative. Gathering and transporting pollen is heavy work and a worker sips nectar to get energy needed for flight. When colonies are vigorous vast numbers of workers are produced. Large colonies can house 20,000 to 80,000 workers all of which are sisters. Chemicals produced by the queen usually prevent the production of new queens in a colony, but in spring if conditions are right, the production of inhibitory chemicals declines and workers construct special royal cells in the waxy comb. The queen lays one egg in each cell and the developing larvae are fed a remarkable food called royal jelly. This special diet administered at just the right time produces a queen bee instead of a lowly worker. As spring wanes and summer approaches, the mother queen lays fewer worker eggs each day and her body slims in preparation for departure from the hive. Her daughters become less attentive and more aggressive and eventually she is pushed from the hive taking with her an entourage of workers. The swarm initiated by the departure of the old mother queen is called the prime swarm and it may contain tens of thousands of bees. The swarm moves to an aerial resting site a short distance from the hive. In our yard a plum tree not far from the hive was a favored target, but the wing of an airplane or a storefront could suffice. From the temporary perch, eager scout bees sally forth to find a permanent nesting site such as a hollow tree or a void in a house. As scouts report back to the settled swarm, they communicate the location of potential nesting sites by performing waggle dances on the sides of the swarm. Scouts describe the location and advertise how commodious the new home will be through their animated dance routine. Other scouts are recruited to visit the potential royal residence. When a sufficiently large quorum of scouts have visited the new digs, the suitability of the new home is confirmed, and scouts return to the temporary bivouac and produce a piping sound as they run about the swarm. This bee song announces that it is time to fly. Workers in the swarm vibrate their muscles to warm up before the swarm takes wing. Scout bees streak through the moving swarm to guide their sisters and the queen to the permanent location. At the entrance to the new nest site workers release chemical signals to guide their colony mates to the new home. Back at the old nest, a battle royal is about to begin as virgin queens emerge from royal cells. The first queen to emerge moves through the hive seeking her rivals on a “search and destroy” mission. She and her royal sisters exchange “words” in the form of sounds called piping and quacking. If a second queen emerges while the first is present, a battle to the death between sisters ensues. Virgin queens leave the hive as smaller afterswarms taking workers with them. Remaining queens wage lethal battles until only one queen remains to rule the hive. If you encounter a swarm of bees, try to remain calm. Although a swarm looks scary, rather than attacking curious bystanders, swarming bees have other business on their minds. Remember, honey bees sting primarily to protect the brood and queen inside their hive. When swarming, honey bees are in the process of founding a new colony and are engaged in finding a nesting site and ensuring that the queen and nest-mates find their way. They are unlikely to sting unless seriously provoked. If you are allergic to stings of bees or wasps and encounter a swarm, calmly move away. Swarms are fascinating and strangely attractive, but try to keep kids and pets from investigating too closely. If the swarm has settled in an out-of-the-way location, you may just leave it alone and the bees will move to a permanent location usually within a few days. If the swarm settles in an inconvenient location and poses a threat, please contact your local beekeepers association, cooperative extension specialist at your county office or state university, or state department of agriculture for advice. Please do not spray a swarm with insecticides or other harmful materials. Remember that all bees provide important services pollinating our crops and native plants. So, give them a break and enjoy one of Nature’s true marvels. Bug of the Week thanks bee loving Patty Neger, Jessica Hoffman, and Sam Champion for providing the inspiration for this episode. We thank Bart Smith for the nice image of a bee swarm. A wonderful series of articles including “Choosing a home: how the scouts in a honey bee swarm perceive the completion of their group decision making”, “Sensory coding of nest-site value in honey bee swarms”, “Thorough warm-up before take-off in honey bee swarms” and “Worker piping in honey bee swarms and its role in preparing for liftoff” by Thomas D. Seeley and his colleagues were used as references for this episode as were the fascinating books “The Insect Societies” by E.O. Wilson and “The Biology of the Honey Bee” by Mark Wilson. To learn more about honey bees in the news, honey bee swarms, and who you can contact to remove swarms, please visit the following web sites.